Hotel Quinta Avenida Habana is one of Havana’s most recent Hotel properties and as such offers the latest modern amenities expected from a brand new hotel. Hotel Quinta Avenida Habana is just a few steps away from the 5th Avenue, probably Havana’s most beautiful tree lined boulevards in the upscale residential district of Miramar. The hotel Quinta Avenida is surrounded by lush tropical grounds and features an enormous swimming pool. 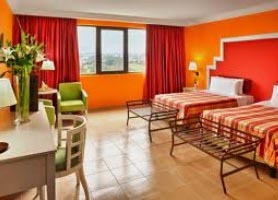 Rooms are large and bright with tasteful decoration, also offering nice views. While Hotel Quinta Avenida Habana offers a more contemporary décor you still know you’re in the Caribbean and Cuba. Due to its peaceful, safe location, easy access, comfort and facilities, the hotel Quinta Avenida is a suitable option for all kind of guests, including those traveling with children. The Hotel Quinta Avenida Habana is often misunderstood by visitors as being way outside of Havana’s main tourist attractions. However, this is simply not true, Old Havana is literally 10 minutes away by taxi and 15 minutes on the Hotels regular shuttle bus will take you to where the below image was taken! The benefit of staying at the Hotel Quinta Avenida Habana is that you retract from the hustle and bustle of Havana into a more sedate surrounding after a long day soaking in the Colonial sights or visiting Tropicana, Bodegita del Medio or the Floridita Bar. For a quick escapade, why not walk down to Havanas national aquarium and swim with the dolphins, it’s just 5 minutes walk from the Hotel Quinta Avenida Habana. 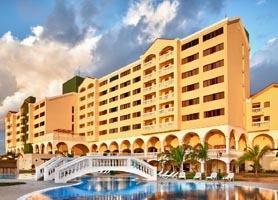 Hotel Quinta Avenida Havana is usually in very high demand and, as such, should be booked in advance. Our booking program allows reservations at Hotel Quinta Avenida without down payment or deposit which will guarantee your dates and also allows preferential modifications should your dates change in the future. 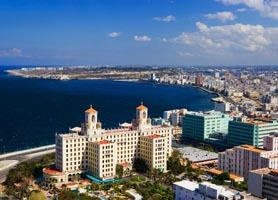 Our booking process is unique because it shows the best rate from all of these for Hotel Quinta Avenida in Havana Cuba and the types of rooms available. 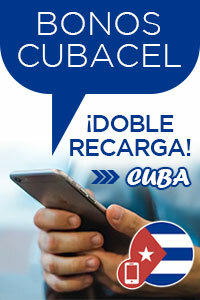 Our Hotel Quinta Avenida Havana rate comparison is an industry first for Cuban Hotels. Once you’ve compared the rates, finalizing the booking at Hotel Quinta Avenida takes just seconds and an immediate confirmation is provided in real-time.